The answer to this question—and any question involving whether or not to undergo plastic surgery—will always be profoundly subjective and deeply personal. Any doctor with your best interest in mind will tell you that the motivation for having a facelift should be innate; it should aim to address your own self-confidence issues, refrain from being influenced by other commentator’s criticisms, and involve realistic expectations regarding the outcome of the procedure. With that being said, flaccid or furrowed skin tissue often affects self-esteem in a severely detrimental way. Facial structures that were once paragons of beauty are affected by time; despite even the best efforts, signs of aging eventually catch up to all of us. What Can a Facelift Provide Me? During their inception, facelift procedures (also referred to as a rhytidectomy) provided the smoothing of skin at the expense of a windblown appearance. With modern technology and technique development, the windblown look is in the past. Patients can enjoy a rejuvenated appearance without any of the drawbacks. 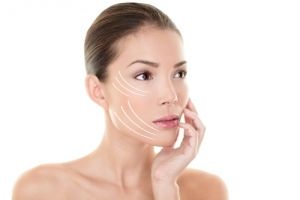 Wrinkles, drooping skin, and facial sagging are all addressed through facelift surgery. Why Should I Choose Face Center LA? Face Center LA utilizes a method referred to as the SMAS (superficial musculoaponeurotic system) technique that provides numerous benefits to the patient. Rather than pulling only the top layer of tissue—standard for traditional facelifts—SMAS technique elevates three layers of skin, avoiding the overly tightened appearance on some facelift patients. SMAS also deviates from the antiquated pull method of traditional facelift surgery. Initially, traditional facelifts pulled the skin horizontally, which is another culprit of the stretched-too-thin appearance; SMAS method facelifts pull the skin vertically, directly opposing the natural sag caused by gravity. Do You Have the Time for the Recovery? For most patients, the healing process will take anywhere between one and three weeks, depending on the severity of your surgery, your body’s capacity to heal, and your commitment to the best healing practices. Here are five ways to ensure a better recovery. Note: the title says for breast augmentation surgery, but these practices are applicable to any type of recovery process. It is typical to experience some bruising and swelling during the healing process, and it is best to avoid any sports or activities that could stress or strain your wounds. If you are interested in learning more about facelift surgery, or if you would like to set up a consultation, contact Face Center LA today by calling 310-857-2088.
https://www.facecenter.la/wp-content/uploads/2017/08/FCLA_logo_90pxh@4x.png 0 0 Face Center LA https://www.facecenter.la/wp-content/uploads/2017/08/FCLA_logo_90pxh@4x.png Face Center LA2018-06-11 15:35:432018-07-10 05:41:16How Do I Know If I Need a Facelift?